The first time I ate Toffee Grahams was at a cookie exchange about 20+ years ago. With tons of different cookies to choose from, I noticed people kept going back to these treats; one taste and I was "hooked". What do they taste like? 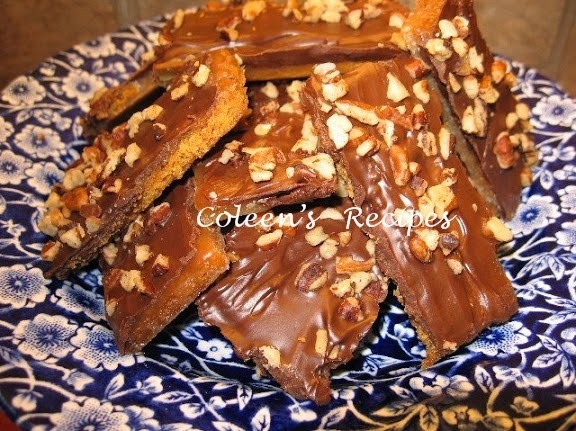 Well, there is a graham cracker layer, a layer of thin crispy caramel (sort of like the coating on caramel corn), then a layer of chocolate and finally a layer of nuts. What's not to like? Line a 10" x 15" pan that has edges, with foil. Spray the foil lightly with cooking spray. Arrange graham crackers in a single layer on the jelly roll pan (should take about 15 graham crackers?). Try to leave as little space between the crackers as possible, but don't overlap them, you may have to break some of the crackers to make it all fit. In a small heavy saucepan, mix the butter and brown sugar. Bring to a GENTLE boil, and cook/stir for 3 minutes (don't start timing until your mixture is boiling). Remove from heat and whisk in the vanilla. Pour the caramel over the graham crackers (spreading it out evenly) and bake in preheated 350° oven for 10 minutes. Remove from oven and sprinkle evenly with the chocolate chips. Wait a few minutes for the heat of the candied crackers to melt the chocolate chips, then spread the chocolate evenly with a knife. Sprinkle your favorite nuts over the melted chocolate. Let the whole pan cool in the fridge for about 20 minutes (just to set the chocolate). When the grahams are completely cool, and the chocolate is set, lift out of the pan and peel off the foil. Break the toffee grahams into pieces and enjoy!!! Ohhh yum...these look like the perfect little treat! I've tried something similar with saltine crackers, but I think we'll like the graham crackers better. Thanks again for another awesome recipe. Perfect for gift giving..anytime of the year! Looks delish! I'm going to have to whip some of this up soon. Thanks for sharing! Isn't it amazing how the less complicated it is the better it tastes! It looks and sounds terrific! keeping this one to make!